My son is now going to a private school that observes Jewish, Christian and the traditional secular holidays so he was off on Monday for Rosh Hashanah. In fact the entire month of September he has one day off each week! With new computer time rules (which are working!) I find it is best to “help” him find things to do if he has a lot of free time. On Labor Day we went fruit picking at Apple Annie’s. This Monday we went hiking up at Mt. Lemmon. Some early fall color starting. We began with lunch at Viv’s Cafe because it is good to start a hike with a full stomach. Then up, up, up the mountain we went. The temperature dropped from 100° to a delicious 72°. We decided to try a new trail and I was hoping to do a loop but after a long time of climbing uphill and unsure of exactly how much further we still had to go we decided to simply turn around. The hike back down was sheer perfection. Blue skies, a few clouds and oddly, some rumbles of thunder in the distance made the perfect autumnal hiking ambience. The path was shaded with dappled patches which I absolutely love! A stop at a scenic overlook on the way home. I believe that is the San Pedro Valley. Driving back down the mountain we could smell rain and observed some wet stretches of road way but no rain fell on us. We decided to stop at DQ for ice cream which ended up being our dinner and came home to collapse on the couch and watch “Harry Potter and the Prisoner of Azkaban”. A dried up plant that screams autumn to me. Best Monday in a really long time. Plan A: Curl up on the couch under an afghan, drink copious amounts of hot beverages and watch the Weather Channel to show my support of my home state of Maryland. 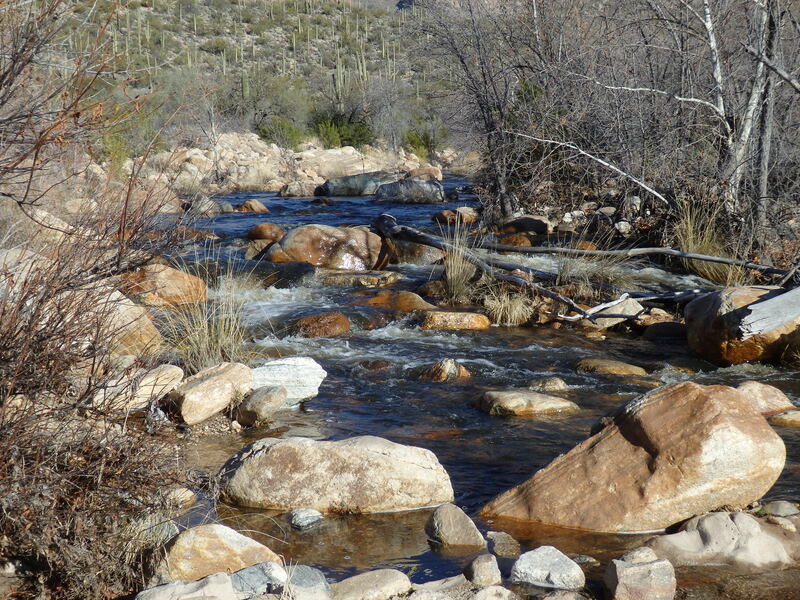 Plan B: Take advantage of a 75 degree day and going hiking at Sabino Canyon. I chose to do both! 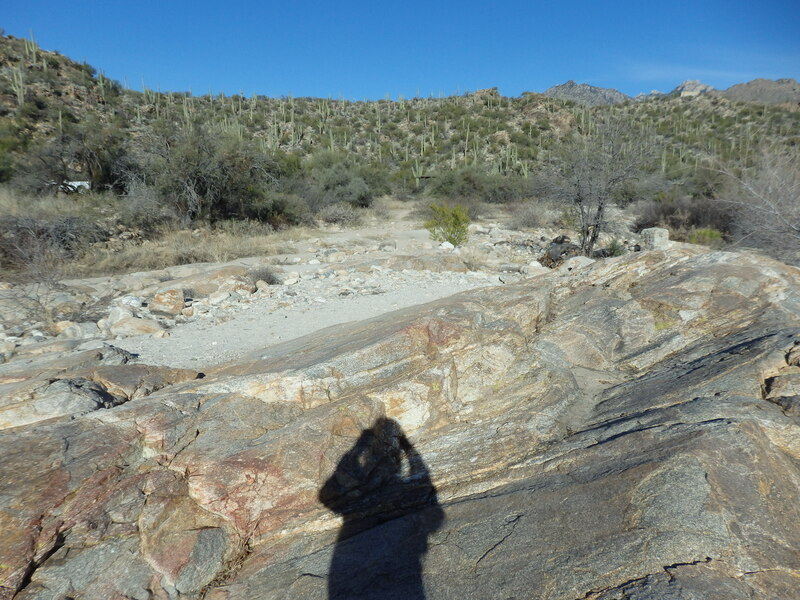 I started with Plan B and spent the morning meandering around Sabino Canyon Recreation Area. 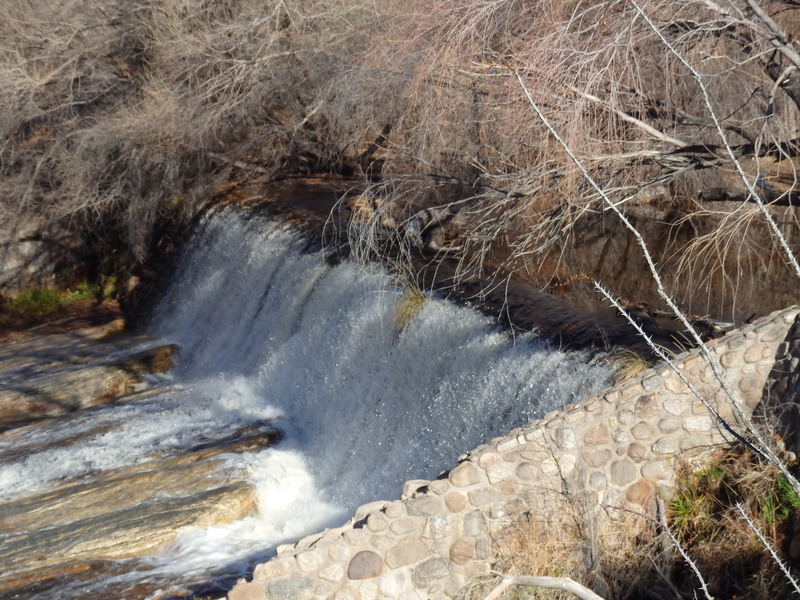 The water was really flowing at Sabino Creek. It hasn’t rained in over a week so it must be snowmelt from higher up. 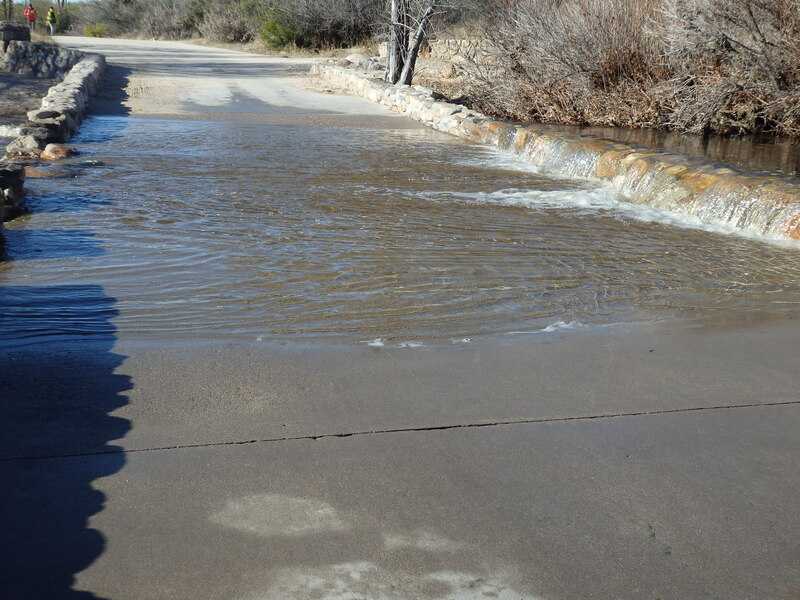 The water was running pretty fast and deep over the usual road I take. 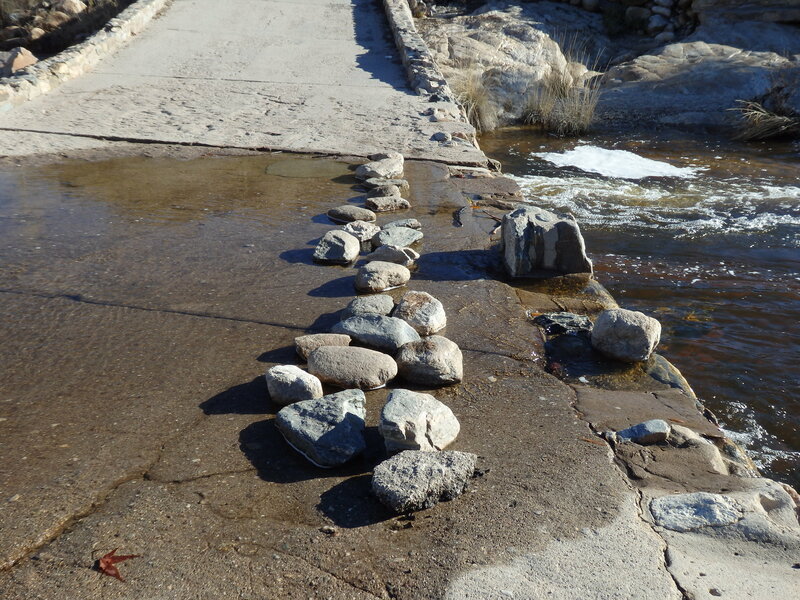 My alternate route was set up by some kind soul with stepping stones to keep feeties dry. 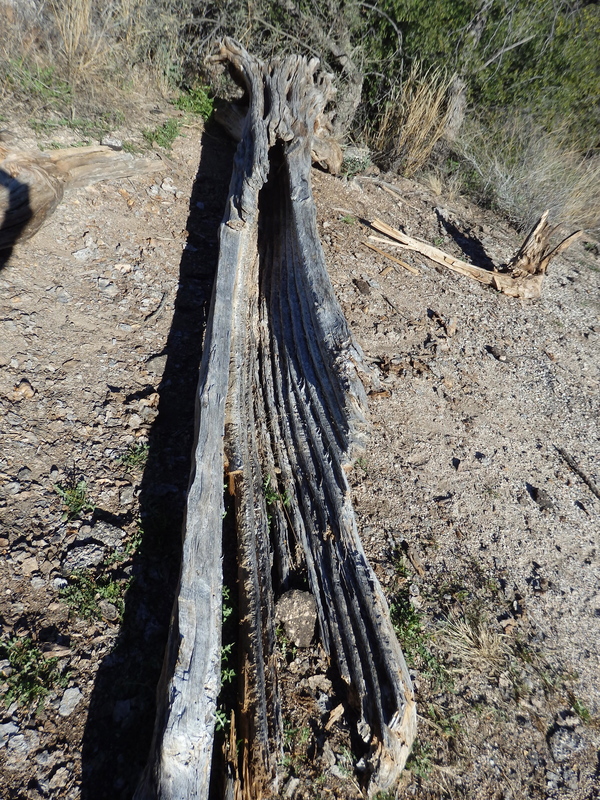 The ribs of a saguaro cactus. When I came home for lunch I watched the weather channel. I miss having weather, real weather. The kind you have to prepare for and that forces you to hunker down for a few days. Oh well, I still have hope for some more rain this winter. Everyone out East please stay safe! 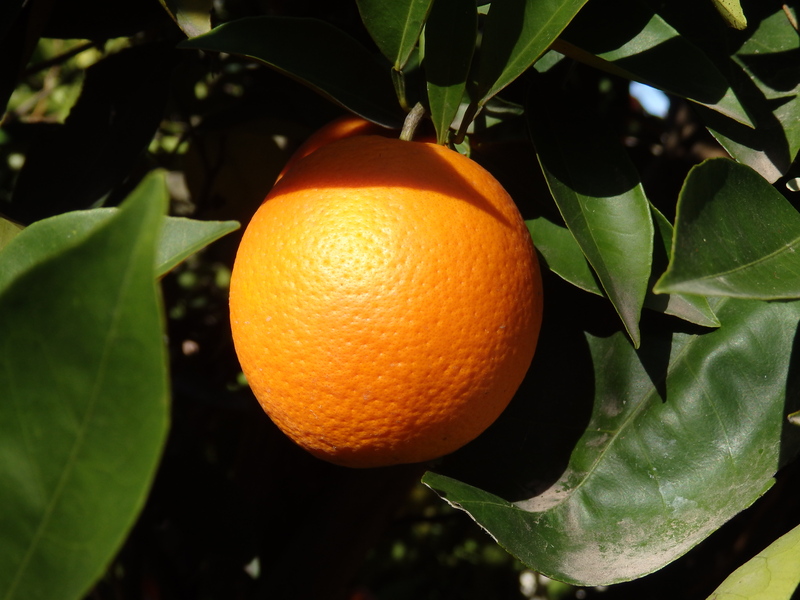 I picked this orange right off my tree for my lunch. Occasionally life in the desert is sweet.